J-Bay Zebra Lodge, commonly called "Zebra Lodge Zebra" Lodge is located at the top of a hill, offering a magnificent 365° view over the Indien Ocean, the bush and the mountain. DREAMING of owning and running one of the most MAGICAL Country House, offering holidays and an experience of pure bliss to your customer? Or developing eco-farming with grapes and olive trees? Then let your fantasy become reality by owning Jeffreys Bay Zebra Lodge. This a place where you can enjoy the beauty of the Eastern Cape at its best. This LUXURY accommodation lodge is situated on the Garden Route, twenty minutes drive from Jeffreys Bay and thirty minutes from Port Elizabeth and 45 from Port Elizabeth International Airport. Visitors are promised outstanding safari tents or luxury suite accommodation, mountain bike hire, two luxury suites and one family room, leopard family room (four guests) and a swimming pool, business services and WiFi. Add to this the presence of wild animals and tranquillity beyond imagination, and you have a recipe for a glorious business. 1) Hospitality - Luxury Country house that includes owners apartment, large garage for two cars, that includes a laundry and ironing room, with 5 luxury room with 50 m2 and more each, a swimming pool. There are the most charming zebra you will find in Africa, tough wild they love the company and are most of the time around the lodge. Guests would wake up in the morning, opening the curtains and have a zebra standing just next to the window! 2) Vineyard (2000 m2) called "Gilwaal Wine Estate" which is a project in partnership with top Stellenbosch winemaker, David Finlayson (DF). The very first bottles of wine, which will be a limited release of a red blend (Shiraz, Cabernet Sauvignon and Grenache) will be available in April 2020 from J-Bay Zebra Lodge only. This property has incredible potential for developing grapes. It's perfect positioning (North Facing) and soil are making this property the best place to grow grapes in the whole Eastern Cape. Someone could extend the vineyard up to 30 ha+. This proper that hold four different biomes would also be perfect to grow olives. 3) Mountain Bike route in partnership with the 3Rivers Trails. This has been started to promote the area and support the local community by providing some very needed jobs. The 3Rivers Trails actually offers over 200 km of trails covering the whole area. In 2017, a devastating fire raged through the whole area and totally destroyed the Lodge. Fully rebuild within 11 months, even better and nicer than before. J-Bay Zebra Lodge is reconquering its market over the months. Within six month operation, J-Bay Zebra Lodge has regained its success and even outperformed its previous season. J-Bay Zebra Lodge is "NEW" as it has been totally rebuild after total destruction from a fire, in June 2017. It re-opened its door to business in May 2018. 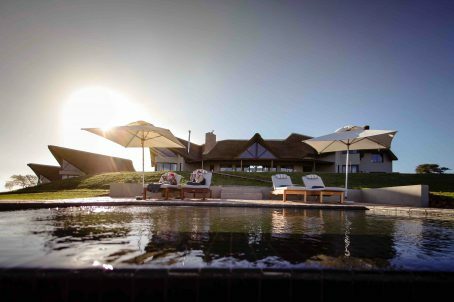 However, J-Bay Zebra Lodge has been operating since December 2012 and, in 2107, has been awarded first price at the Lilizela Award (organised by Tourism Grading South Africa (TGSA), making J-Bay Zebra Lodge "THE BEST 4* COUNTRY HOUSE IN SOUTH AFRICA". However, due to the period of reconstruction, J-Bay Zebra Lodge could not defend its title in 2018.